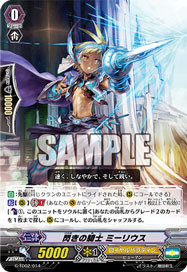 [C] [(V)/(R)]: If neither "Stealth Demonic Dragon, Magatsu Storm" nor "Ninja Dragon, Magatsu Gale" is in your (V), this gets -5000 Power. [A] [(V)/(R)]: When this attacks, this gains +2000 Power for the battle. Ninja is the shadow. Valor where nobody knows, dies where nobody knows.